Ottawa is bracing for another big dump of snow expected to start tomorrow. The city crews can’t seem to catch a break this winter. The snow situation is made worse by the cycles of thaws and flash freezes that we’ve had. I hope everyone stays safe. 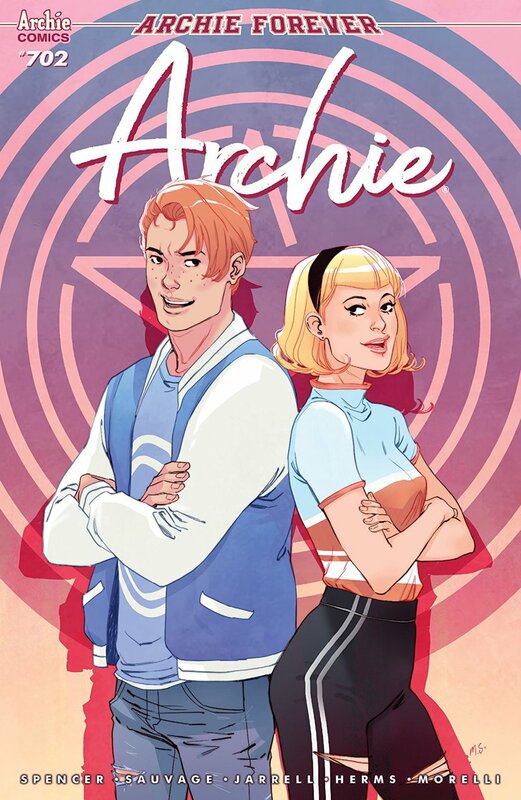 Archie #702 – Nick Spencer (writer) Marguerite Sauvage (art pages 1-4) Sandy Jarrell (artist pages 5-20) Matt Herms (colours pages 5-20) Jack Morelli (letters). The mystery of Reggie’s dad’s disappearance deepens. Meanwhile Betty and Veronica try to figure out who Archie’s new girlfriend is. I loved the art in the first 5 pages. Sandy’s work in the rest of this issue wasn’t so bad that it turned me off so I’m going to keep reading. I was sad to find out that Midge is a bit skeevy when it comes to dating. Batman #64 – Joshua Williamson (writer) Guillem March (art) Tomeu Morey (colours) Steve Wands (letters). The Price of Justice part 1 of 4. Argh! 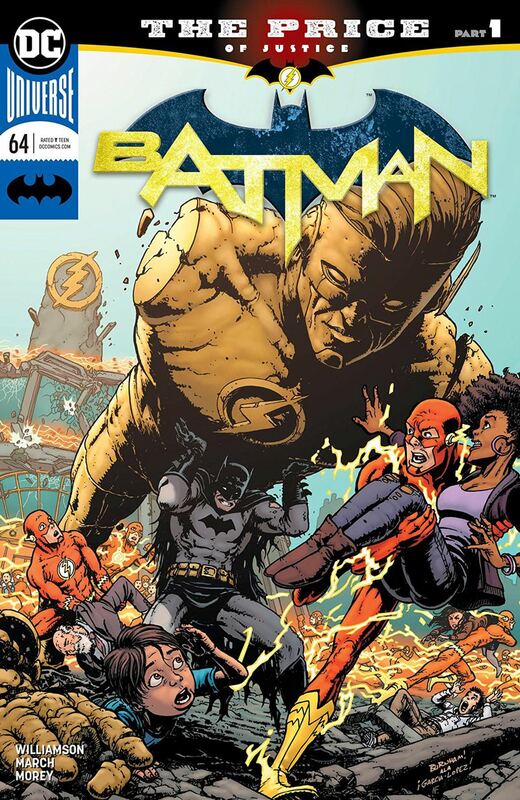 We’ve got a couple of cross over issues with The Flash before getting back to the Batman story already in progress. I like the teasers for Heroes in Crisis because that’s a good story that Bat fans might not know about. I won’t be reading the parts in Flash unless the next issue makes me feel like I’m missing important elements of the mystery. It sure was nice to see Guillem March’s art again. X-23 #9 – Mariko Tamaki (writer) Diego Olortegui (pencils) Walden Wong, JP Mayer & Scott Hanna (inks) Chris O’Halloran (colours) VC’s Cory Petit (letters). X-Assassin part 3. The cyborg clone gets a name. Laura breaks into the facility where T.U.O.K.S. (toques) was built. I like where they’re going with this new character. The double page fight scene with Laura going through the army of robots was amazing. This book is still rocking it. 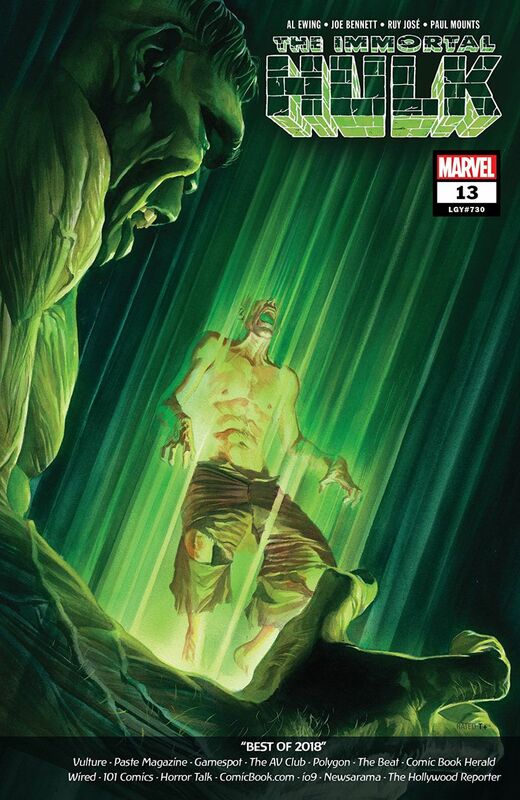 The Immortal Hulk #13 – Al Ewing (writer) Joe Bennett (pencils) Ruy Jose with Belardino Brabo & Rafael Fonteriz (inks) Paul Mounts (colours) VC’s Cory Petit (letters). The Hulk in hell story concludes with a new relationship forged between Bruce Banner and the big green galoot. I like this development. It means we see more of Betty Ross if nothing else. 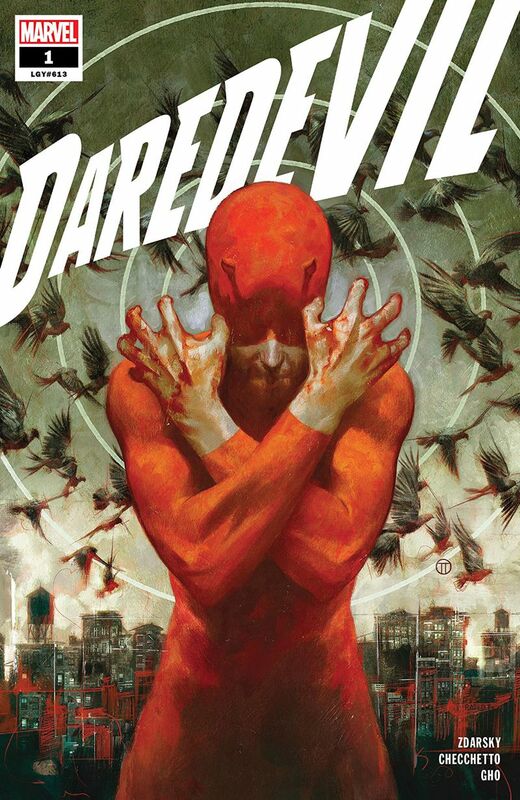 Daredevil #1/LGY #613 – Chip Zdarsky (writer) Marco Checchetto (art) Sunny Gho (colours) VC’s Clayton Cowles (letters). Know Fear part 1. It’s months after the 5-issue Man Without Fear mini and Daredevil is back patrolling Hell’s Kitchen striking fear into the hearts of bad guys. He’s a little rusty. Matt’s got more to worry about than Mayor Wilson Fisk, as a new character is introduced who will certainly be a thorn in Daredevil’s side. Big man Detective Cole North has just transferred from Chicago and he doesn’t take any poop from nobody. The cat and mouse chase should be interesting for a while. 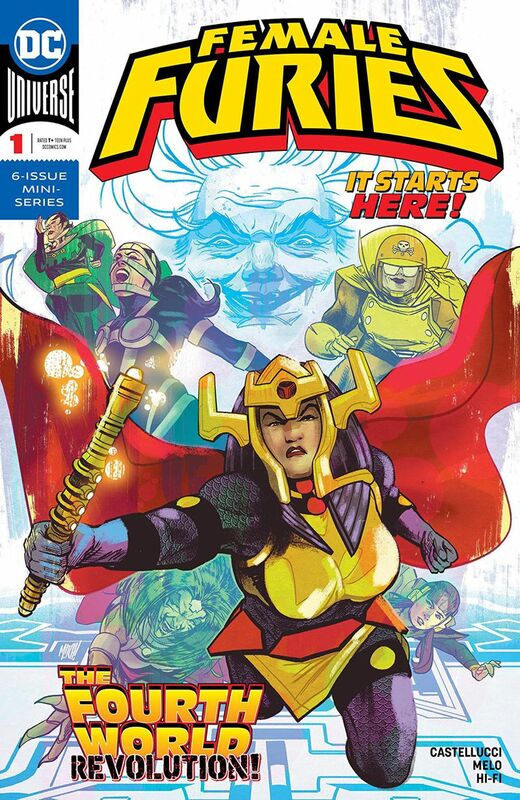 Female Furies #1 – Cecil Castellucci (writer) Adriana Melo (art) Hi-Fi (colours) Carlos M. Mangual (letters). 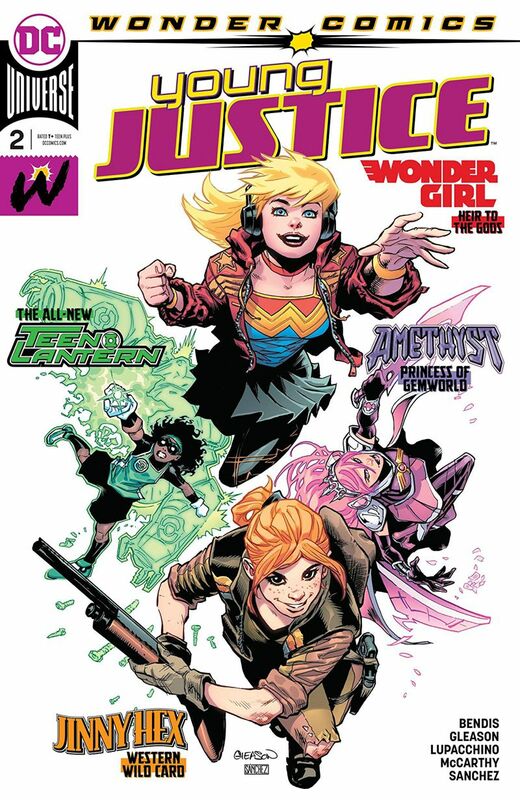 I wouldn’t start The Fourth World Revolution with this 6-issue mini about Granny Goodness and her women warriors of Apokalips seeing as how bad this first issue is. I found the misogynistic behaviour of Darkseid and his lieutenants heavy handed. An obvious manipulation of readers’ emotions. These women deserved better. The art was a nice tribute to Jack Kirby but that’s not enough to keep me reading. 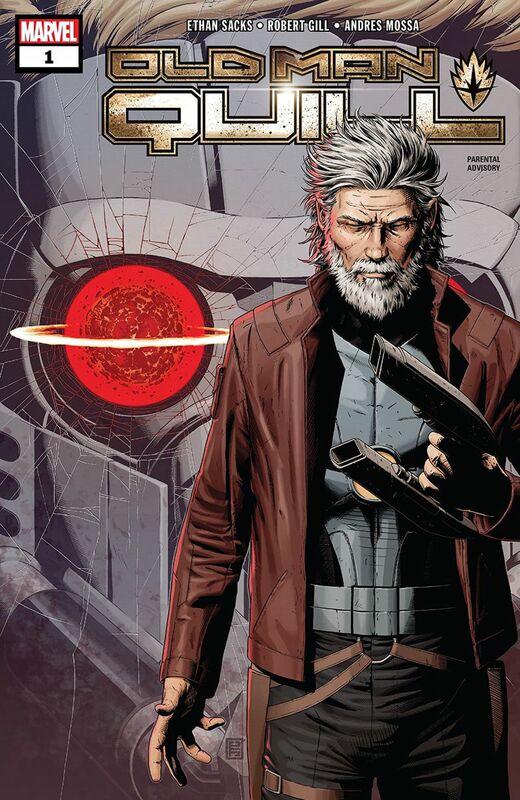 Old Man Quill #1 – Ethan Sacks (writer) Robert Gill (art) Andres Mossa (colours) VC’s Joe Caramagna (letters). 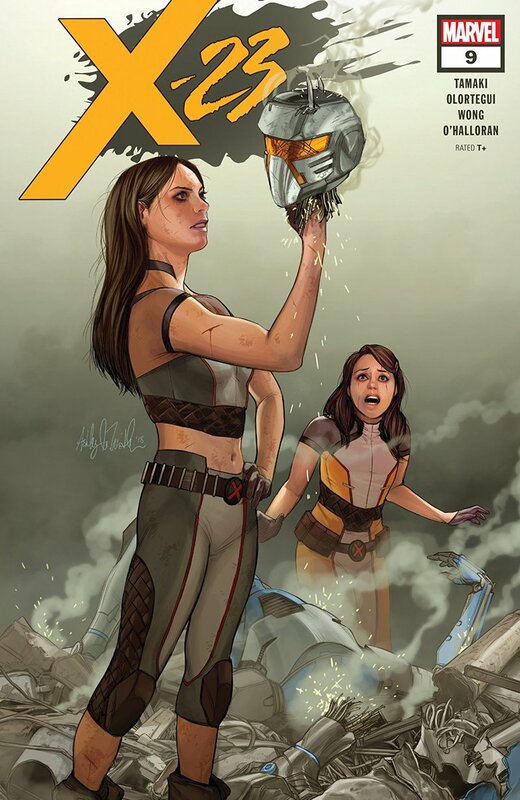 This new 12-issue maxi about another aged hero had a promising start but then it lost me when the rest of the Guardians of the Galaxy showed up and they crash land on Earth. I liked Ethan’s Old Man Hawkeye story but I’m not a big Starlord fan so I needed something different to get me hooked on this new story. Having an older Peter Quill lose his family (boo hoo) and then dive into a bottle to dull the pain until his old pals show up wasn’t enough. Young Justice #2 – Brian Michael Bendis (writer) Patrick Gleason & Emanuela Lupacchino (art) Ray McCarthy (inks pages 9-18) Alejandro Sanchez (colours) Josh Reed (letters). It’s established that the team is on Gemworld helping out Amethyst but we still need to meet each member. 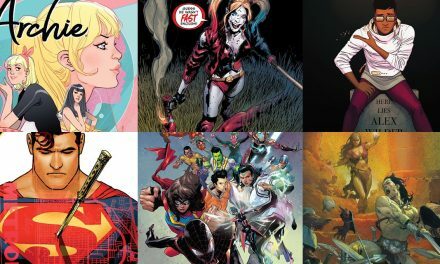 This time we get to know Cassie Sandsmark/Wonder Girl a little more. 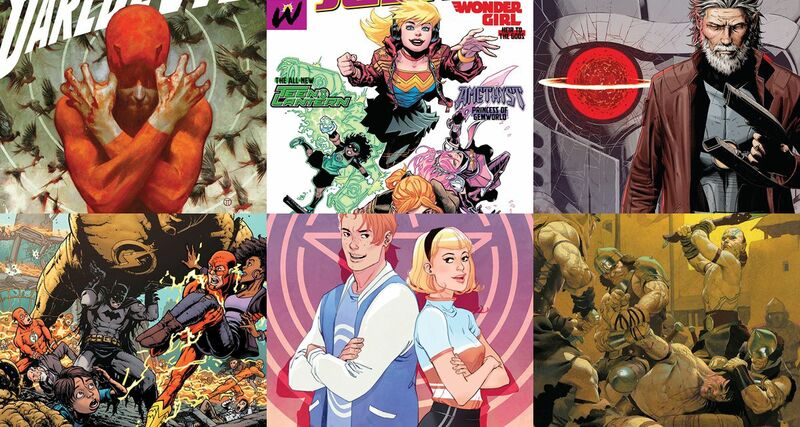 I can’t wait to learn more about Jinny Hex and Teen Lantern. 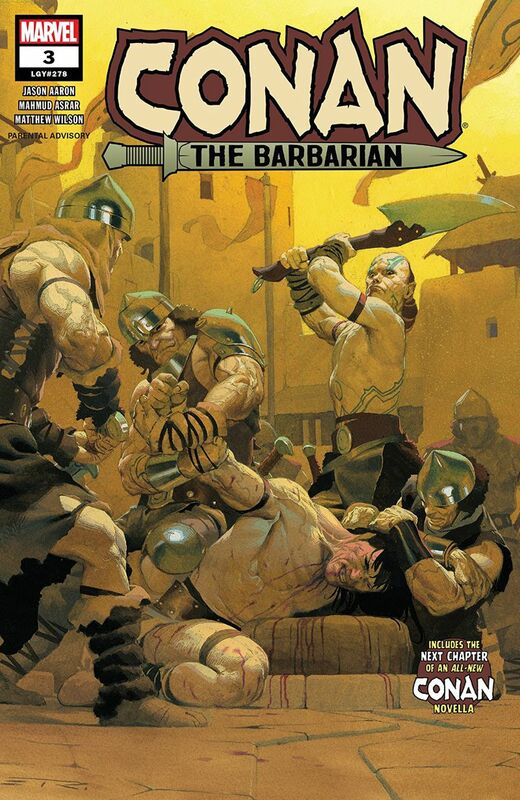 Conan The Barbarian #3 – Jason Aaron (writer) Mahmud Asrar (art) Matthew Wilson (colours) VC’s Travis Lanham (letters). The Life & Death of Conan part 3. A couple of creepy kids have captured old King Conan but this issue goes back to when Conan was a teenage thief. How is the seventeen year old Cimmerian going to get out of a death sentence after he’s caught? It’s actually very fortuitous, by Crom. I really love the cover by Esad Ribic. Avengers #14 – Jason Aaron (writer) David Marquez (art) Justin Ponsor & Erick Arciniega (colours) VC’s Cory Petit (letters). The current Vampire War that has the team’s full attention introduces a new super villain team. They’re new The Legion of the Unliving lead by the Shadow Colonel. I’m curious as to why there’s a mini Man-Thing on the colonel’s shoulders. 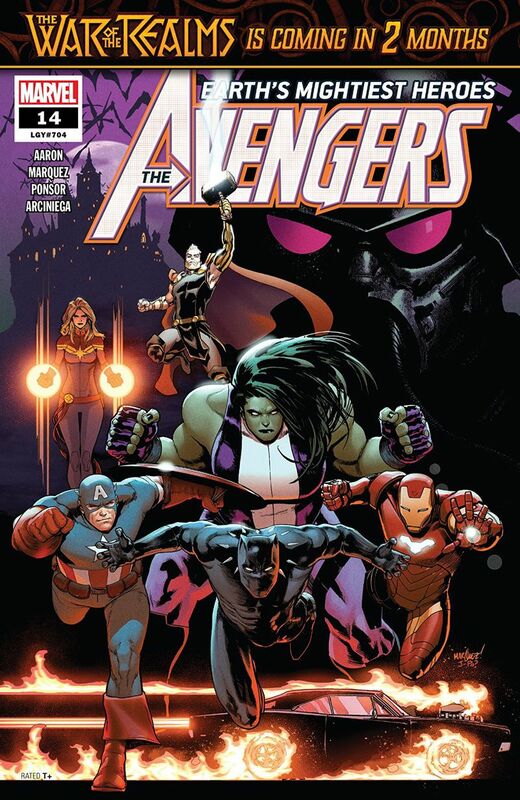 With the Ghost Rider on the Avengers team and Blade, the vampire killer helping out it looks like the good guys are in great shape to save humanity from the blood suckers until one of the good guys is compromised. I like T’Challa and Tony working together and the focus on each team member’s fight this issue. I don’t like the new dumb downed She-Hulk. I just don’t see why she has to talk like a cavewoman.